On arrival at Coimbatore Airport/Railway station, our representative will pick you up and drive to Ooty. On arrival check into the hotel in Ooty. Remaining day is free at your leisure. However, you have the option to shop at the local markets or treat your taste buds with some regional delicacies. Overnight stay at the hotel. Post breakfast, proceed for a memorable sightseeing tour of Ooty. Start your sightseeing with a visit to Doddabetta Peak. This highest peak in the Nilgiri Hills offers commanding views of the neighboring region. Visits to the Botanical Garden and the Ooty Lake are also part of your itinerary. Apart from that, you can also enjoy horse riding and boating at the lakeside (On direct Payment). Later return to your hotel. Overnight stay at the hotel. After a scrumptious breakfast, check-out from the hotel and drive towards Kodaikanal, one of the prominent hill stations in south India. Its greenery covered hills and cascading waterfalls leave you awestruck. On arrival, check-in to the hotel and relax. The evening is free at your leisure. Explore the local markets or try some local delicacies. Later return to your hotel. Overnight stay at the hotel. Enjoy a delicious breakfast at the hotel and set out for a half day city tour of Kodaikanal. This small town in Tamil Nadu is home to several interesting tourist attractions that include Bryant Park, Coaker's Walk, Pillar Rock and Berijam Lake. 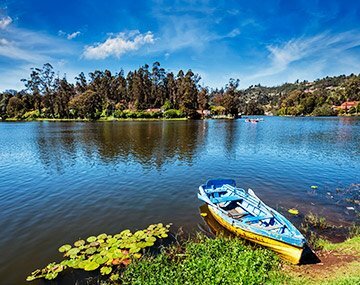 The evening is reserved for a visit to an artificial star shaped lake, known as Kodai Lake (spreading across sixty acres of land). After visiting the lake return to your hotel. Overnight stay at the hotel. Your tour concludes today. After breakfast check-out from the hotel and get transferred to the Coimbatore Airport/Railway station to board a flight/train for onward journey. Offering much-desired respite from the scorching heat of the plains, Ooty and Kodaikanal invite travelers to spend some days of leisure in their cool, cozy and captivating ambiance. Travelers respond to their invitation with warmth and search for Ooty-Kodaikanal tour packages to explore these destinations which are lovingly called as the Queen (Ooty) and the Princess of the Hill Stations. Decked with diverse flora and fauna, and cascading waterfalls, made alive with interesting activities and spiced up with delicious delicacies, these destinations are ideal for family vacationers, nature lovers and couples in love. Plan a trip today to spend some moments of fun and tranquility at these lovely hill stations in south India. Apart from nature’s bounties and pleasant climate, a lot of other things need to be arranged for a rejuvenating vacation in the hills. Hotels, resort, activities, transport and a whole array of things have to be lined up for a flawless vacation. Arranging these things at a place, which you are not very familiar with, is easier said than done. At BookOtrip, we have years of experience in arranging holiday packages for Ooty and Kodaikanal that we leverage for our clients. Our long association with suppliers enable us to find cheap deals on hotels, activities and other services that we make available to you. Booking with us is quite easy. You can do it yourself or call our trip experts for assistance. Bookings showing the incorrect age of passenger/passengers may lead to a penalty at a later stage. Tickets and vouchers will reach to customers two days before the date of departure/travel. In case of Hotel unavailability alternate hotel will be provided. BookOtrip gave me a scenic view of Nilgiri hills and I would like to visit it again and again ! !